The Model PHE-5555-10 pH electrode allows for quick insertion using our simple “twist and lock” adapter, as shown in the diagram above. 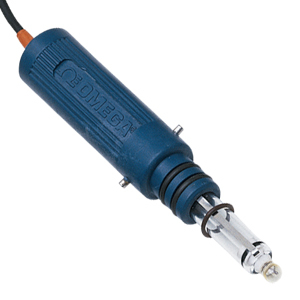 This combination electrode incorporates pH, reference and solution ground in a robust PPS housing. Double junction reference construction makes the PHE-5555 highly resistant to electrode poisoning. 참고: Comes complete with electrode care instruction sheet and 3 m (10 ft) of cable. For non standard cable lengths, replace the suffix "-10" in the model number with the required length in feet, add $2 per foot to price. (Additional per foot cost applies to the entire cable length).